Salmon Leather: A Fishy Fabric, But Will Designers Take the Bait? n. 1 a: A dyeable textile made from salmon skin—a byproduct of the fish processing industry that usually gets tossed into the landfill—using chemicals that are less toxic than those for tanning mammal hides because fish scales are easier to remove from skin than hair. (Note: no new salmon is killed expressly for its skin.) b: A resilient fabric that is stronger than most land leathers—and does not smell like fish. 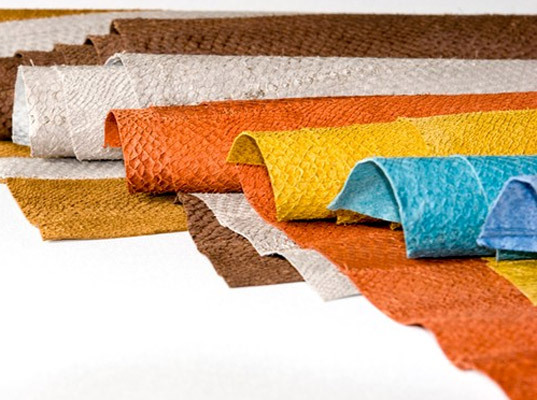 c: A reliable, affordable source of “sea leather” used by companies such as ES Salmon Leather, One October, Unnurwear, and Skini London in clothing, accessories, furnishing, home decor, and even bikinis. Salmon leather was recently used in the form of die-cut paillettes by fashion designer Isaac Mizrahi to create an entire ensemble (jacket, dress, open-back shoes) for the Nature Conservancy’s “Design for a Living World” exhibition at the Cooper-Hewitt Museum in New York City. Wearing skin is disgusting no matter what kind of animal it came from. Salmon is not an environmentally friendly source of food or fabric: http://www.patagonia.com/web/us/patagonia.go?slc=en_US&sct=US&assetid=18260 http://www.ourrivers.ca/video-library-mainmenu-29/salmon-farming-chile Salmon farms devastate the waterways they are created in and when the area is abused beyond use (usually resulting in algae-laden, oxygen-depleted "dead zones") the farms simply move in to pristine waters to continue their unsustainable practices. You should do some reading into the devastation Norwegian multi-nationals are wreaking in Chile's Patagonian fjords in one of the most remote, pristine environments left. It staggers me that a site talking about "vegan style" regards wearing the skin of another animal to be acceptable - but then it's only worth protecting if it's furry with big brown eyes right? In most fishing industries the byproduct (waste) after removing the food product is used to make excellent fertilizer. It's a shame if the Chilean farmed fish industry was actually throwing this rich fertilizer away. And in that case should we really be supporting the farmed fish industry, given the ecological damage, and problems that the farmed fish industry creates (disease transmission to wild fish stock, using high-protein fish to feed farmed fish, addition of dyes to farmed salmon feed pellets, etc.). please watch the video Silver Harvest; as many of the claims you are making about salmon farms are untrue. I find the salmon skin amazing! Man is presently King of this Earth. We shall use it to our best ability. Go Naked if you hate others so deeply and bare your true soul if you really dare. Fakers. Check out Tidal vision! They only buy salmon byproducts from fishing companies who employ sustainable practices and never from those who are further damaging the oceans/ rivers' ecosystems�thereby incentivising sustainable fishing as a whole. Hopefully other producers get on board in the same way. In regards to khrysteenalee's argument against leather in general: It doesn't seem like people are going to stop eating meat completely anytime soon, so they're getting eating anyhow, we should DEFINITELY be using the whole animal, right? Just saying. Isaac Mizrahi's outfit for "Design for a Living World"